LOL,maybe that was it. Like to see the look on the O'l boys face when they cut his tie. Won't tell you about the green beans and the jalapenos in the beans. Try this somtime. STEP 1 - Strip back the husk, starting at thee top of the ear of corn; the motion is rather like that of peeling a banana. Leave the husk attached at the stem end. STEP 2 - Remove the corn silk and fold the husk back over the stalk. Tie the husk with string to form a handle. Tips - Buy corn in the husk. When you fold the husk back, it makes a handle for holding the corn while you eat it. When buying corn, inspect it ear by ear (if allowed) by stripping back a portion of the husk. Look for ears with plump, juicy, fully formed kernels. STEP 1 - Brush the corn with the garlic butter as it grills. The ears are cooked when golden brown, after 8 to 12 minutes. Note how the corn has been placed at the edge of the grill grate so the husks extend over the side away from the fire. STEP 2 - Another way to keep the husks from burning is to slide a sheet of aluminum foil under them. Tip - The recipe below calls for basting the corn with garlic-parsley butter. To simplify things (and this is often what I do on a weeknight), just brush the corn with olive oil or melted butter and season it with salt and pepper. 1. Set up the grill for direct grilling and preheat to high. 2. Fashion the husk of each ear of corn into a handle as shown in Preparing the Corn, Steps 1 and 2 on the facing page, and remove the corn silk. 3. Place the butter, parsley, and garlic in a mixing bowl and whisk or beat until smooth and creamy. 4. When ready to cook, lightly brush each ear of corn with a little of the garlic-parsley butter and arrange on the hot grate, positioning the ears in such a way that the husks are away from the fire. Grill the corn until the kernels are handsomely browned all over, 8 to 12 minutes in all, turning as needed, brushing with the remaining butter, and seasoning generously with salt and pepper. Remove the corn from the grill and serve at once. Variations: Dill, basil, or tarragon all make tasty alternatives to the parsley in the butter. Grilled corn kernels make a delectable addition to salsas and salads. Lay the ears on their side and cut the kernels off the cob with broad lengthwise strokes of a knife. Try puting some wet mesquite chips as well. Sure you not from TX. LOL. You're tellin an NDN how to cook corn?? Sorry...I guess I was tellin a Texan how to BBQ...Hey got any good TexMex recipes? Never tried jalapenos in green beans. I have two crops of string beans in the garden right now, one crop is just startin to bloom. I'll have to try out the jalapeno but maybe some smokey venison chunks in there too. We used to eat prickly pear pads that way-they taste like string beans. Hey do you sell cured yote hides? I'm not into varmint hunting but would love a yotey hide...make me feel more at home. I just got on your web board, nice photos! Suz, vmaster, you guys make me hunger. Think I'll headout and get some lunch! Thanks for the recipe. Sorry but I don't know. What is an NDN ? Done the prickly pear thing as well. I don't sale the hides. But someone on the board may just ask them. Thanks for joining up. If you want post some pics. from where you live. Have a friend who's like a brother to me from up your way. 1. Mix the cumin, powered red chiles, chopped jalapenos and garlic together in a small bowl, then rub on all sides of the meat. Put the skirt steak into the dish and top with onions. Pour the lime juice and the jalapeno liquid over all areas to coat. Cover and refrigerate at least 1 hour, but preferably overnight, turning once. 2. Preheat the grill or broiler until hot. Mix together the oil and liquid smoke and brush onto the meat surfaces. Grill or broil about 2 to 3 minutes on each side, or until the outside is brown and slightly charred, and the inside is still slightly pink. Cut the meat into thin strips. Serve with warm flour tortillas and fresh salsa. Like the first and last definition best. Sorry but I don't know. What is an NDN ? Well heck I belong to that group then. Now the "No Defect Noted" could apply to Suz too! Vmasterbaby.......!!!!!! 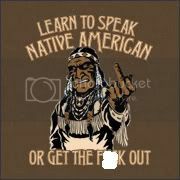 NDN Indian NDN Indian NDN Indian NDN Indian NDN Indian NDN Indian NDN Indian NDN Indian weird how it sounds the same....I got that from an NDN blog and thought it was clever so I started using it, hope no-one is offended. No defect noted, yeah right. More like noted defects negligible. Just the sound of that recipe is makin be dribble, what time is supper? I think I can smell it! Thank you that sounds really goooood and freeekin H_O_T! I'll have to put on my dress whites to keep cool! No one here is offended. Just the first time I have heard it. Both of my grandmother were Indians and I'm proud of that. My grandmother on my dad's side was 100% Blackfoot "original people" and on my mom's side was 100% Cherokee "Principal People". On my dad's side Scotch and on my mom's side Normon.